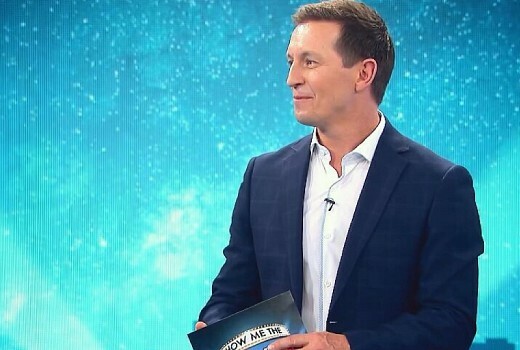 I guess it’s just a stark reality of life that when a triple Gold Logie winner returns home to a network and expresses a desire to revive late night TV that we end up with a 1 hour quiz show with an entire segment pushing a commercial product. What The? Welcome to 2018. Variety shows don’t come cheap. Building a segment around a movie release helps pay the bills and is clever product placement. Show Me the Movie returned Rove to TEN for the first time since his hosting of The Project (which his company produces). On a spartan set he roved between two teams, Grant Denyer-like: Jane Harber, Paul Mercurio, Tegan Higginbotham / Joel Creasey (no need to ask Who Would You Turn Gay For? ), Angela Bishop, Frank Woodley -who may have been hanging around the studio since his appearance on the first Cram. This was seemingly license to shout-host for nearly the entire duration of the show. OK! YOU’RE EXCITED. YOU’RE ALSO MIKED. A series of mostly-parlour games followed, borrowing heavily upon a universe that is Spicks & Specks or Talkin’ ‘Bout Your Generation. They included Movie Mistakes, identifying cinema bloopers; The Unusual Suspects, guessing the height of Hollywood stars; and Matchy Matchy, identifying missed casting opportunities. Sometimes there were too many anecdotes and not enough game play. It’s important to remember your genre, and stay in your lane. In You Know That Movie Where, panelists had to describe a film without naming the star. Racing against the clock they were practically foaming at the mouth in a segment that could benefit from more air. Or My Charader. A full segment around an upcoming Pacific Rim sequel required everybody to watch the trailer and Cram (oh wait that’s another show) useless pieces of information on recall. A pre-recorded Rove interview with star Scott Eastwood followed (again straying from the genre). I guess if this could showcase Australian films and bring a star onto the set it would be good for everybody. Team captains Joel Creasey and Jane Harber were in the spirit of the game, with the latter looking like a million bucks. Angela Bishop was arguably under-utilised given her encyclopaedia of knowledge, but that’s the gig. By the sound of the laughter the studio audience had a pretty good time, perhaps over-compensating for those of us on the couch who missed the atmosphere. The show is also up against the same fate as other panel shows before it on commercial telly: it’s outstays its welcome. Spicks & Specks was a joy at 30 minutes without ads, where we got to spend time between a musically eclectic bunch, and the gameplay became incidental to their charms. So after all that, What Have We Learnt? I’ve learned Liam Hemsworth is taller than Chris. I’ve learned there are schoolgirls in Pacific Rim: Uprising trailer. And I’ve learned I miss late night variety. Show Me the Movie airs 7:30pm Thursdays on TEN. David, I tried, I really tried to like this, but what a dog’s dinner of a mess of a show. I finally caught up with it on the weekend, and was astounded at how badly it was put together. Rove adds some class to the riot he is overseeing, but even he looks bewildered at times. My biggest issue was Joel Creasey, who is yet again far too OTT and too over-hyped to make for good viewing. He screeches and shrieks and is becomes weaeing. His over-excitable manner is just too much for the screen, and after 15 minutes, I turned off. This show is pretty bad, and Rove – what on earth were you thinking? I won’t be going back for more. Joel is hired to be animated, it’s kinda his act. He’s a great guy, but for some it can be polarising. I haven’t warmed to it any further than the review, which somebody told me was being negative. I agree with most of the views on show me the money , but I think its time for Tonight Live to come back maybe with Rove , we need late night Australian Variety and I think if it wasn’t for the cost it could happen. I don’t think Show me the money will last more than 4 weeks as the ratings will drop week by week as there isn’t anything new about the show that will keep the audience onboard. I was expecting a witty version of Margaret and David, discussing the latest releases… That gave me a headache. Was very impressed with Angela Bishop, wish she’d featured more strongly. Rove was so loud and hectic! I can see room for improvement, but I won’t watch it again. Firstly, kudos to Network Ten for giving airtime to Show Me the Movie. Much better an Australian-produced show getting a run on commercial television than a re-run of some inane rubbish from overseas. But, sadly, SMtM requires a lot of improvement to warrant a primetime berth. Rove seems too eager to please. He clearly realises a great part of the show’s success lies in the input and enthusiasm of his co-contributors and he goes overboard to drag them into his vortex. Rove needs to take a step back and follow the Adam Hills approach of allowing his co-stars to naturally come to the fore. Sounds like Cram but with movies and a lot more guesswork. Lots of camerawork issues — annoyed me. Hopefully it improves with practice. These will be due to the challenges of the space. Very small studio, trying its best for light entertainment. I think it is the same place where Cram, Hughesy We Have A Problem and perhaps the new Family Feud are filmed? They should film more at where Rove used to do his shows or The Panel, GMA, Thank God You’re Here, etc. Could maybe even make use of the Neighbours studios for more than just Neighbours again. 10 used to give it’s shows quite a bit of space. The recent shows popping up all seem very small. “And I’ve learned I miss late night variety.”…..me too…oops…me as well…. I’ve missed it since Rove decided to end his series and go over to America. No one has put on a show to replace Hey Hey, Rove live or The Panel. The closest we have to any of that is The Project and breakfast TV (but breakfast TV has pretty much always been there, and it isn’t a suitable replacement as many are at work/school). Cut out the pathetic attempts at humour, cut it down to 30 minutes and fix the desks, get Rove to sit still and not shout, and get rid of Joel Creasey, Then you might have a watchable show, I enjoyed it but it went on too long, I think Ten have forgotten the rule keep the audience wanting more, and dont give it to them until next week. Having been a projectionist for many years I found some of the mistakes interesting giving that I had screened some of the movies multiple times and not picked up on those mistakes. Some great films in there, too bad Frank Woodley was there trying to be funny. I think we owe TEN the usual three weeks for SMTM to settle in and find its audience. Traditionally, the network PR and Promo people are responsible for the audience (I.e. : the ratings) in Week 1. Word of mouth adds to or subtracts from that audience in Week 2. And by Week 3 the numbers become steady and management reckon they’ve got a handle on what the show’s ongoing ratings are likely to be. Of course, if you own the network, you can pull a show while it’s first episode is actually going to air – as Packer famously did to Mulray. But generally, a network gives a new show three weeks to unveil its potential, before management starts discussing its future. The question is… is this filmed weekly? I believe a few already in the can, probably at least 4. The ad for it made me cringe and I had no plans to watch it. Then I heard Joel in a morning radio interview yesterday and it sparked a little interest, so I set it to record. I watched it later on last night but didn’t really enjoy it. I deleted the series link immediately. David, It is such a pity that you can’t see your way to being positive about this show. You spend a lot of time lecturing that TEN need to try new things and take some risks. Every time they do, you are relentlessly negative. In fact you and most others are just relentlessly negative about TEN most of the time regardless. Maybe it has just become sport for the site and contributors to the site? Thanks for the feedback. I think you might want to take a look at the review for Hughesy, We Have a Problem and rethink the claim. You might also note that I posted a Programming post for the show yesterday, and have given it good coverage in Ratings news today, both separate to the critique. But since you’ve raised it, I also offered SMTM a feature interview and it went unfulfilled by the network. I might add it to the other 3 interview offers recently all of which are equally unfulfilled. As the lowest rating commercial network I can’t imagine CBS is too pleased with that. Numbers for SMTM can be built upon. I hope Rove pulls back on the shouting tho. Show Me The Microphone – it’s on your lapel Rove. Can the director please pass this on. There were a lot of laughs watching this in our household. I really enjoyed it, nice to have something different. I think it’ll settle in nicely. For the most part I enjoyed it… but yes, it outstayed it’s welcome by a long way and towards the end I was feeling the pinch. Jane and Joel were good captains I thought… but again, the editing of shows like this really is the reason the atmosphere is taken away to an extent… I did laugh a few times… well, giggled. This shows again why Spicks & Specks was so special… it had the Midas touch in regards to balance. Bottom line is that I’ll be watching again next week… and hopefully there will be tweaks before the end of the first season. Stick with Hughesy We Have a Problem. I miss late night variety too. It would be fantastic to have a once a week live variety/talk show like Graham Norton.